288 rolls (i.e. 12 boxes of 24 rolls) of extra strong reinforced gummed paper tape, each roll being 48mm x 100M, 130gsm in thickness. Gummed paper tape, also known as water activated tape, is an excellent solution for securing parcels and packages. The tape is tamper evident and 100% environmentally friendly and recyclable, and is the strongest tape solution in the market. Once wet and sealed, it effectively acts bonds the cardboard on the box together and cannot be opened without tearing the tape. This solution is used by some of the largest distribution centres in the UK. : Integral Closure - the water activated adhesives in gummed paper tape penetrate into the fibres of the carton, creating a total bond. As the tape has become an integral part of the carton, this adds considerable strength to the closure as opposed to just a top surface bond of standard packaging adhesive. Tamper Evidence - Gummed paper tape cannot be removed from the carton without leaving traces of damage, unlike standard packaging tapes which can be removed without a visible trace. 100% Recyclability - Gummed paper tape is made from renewable natural resources, making it the environmentally friendly choice for the packaging professional. Temperature tolerant - even in extreme temperature conditions, the characteristics of gummed paper tape remain constant. In extreme heat, humidity and cold, the seal retains its strength whilst the seal also remains highly resistant to aging as well as making it the ideal solution for long term storage. Improved packaging presentation - gummed paper tape also out-performs on presentation against plastic tape. Gummed paper tape always secures flat to the carton and blends with the character of the cardboard carton it is sealing. 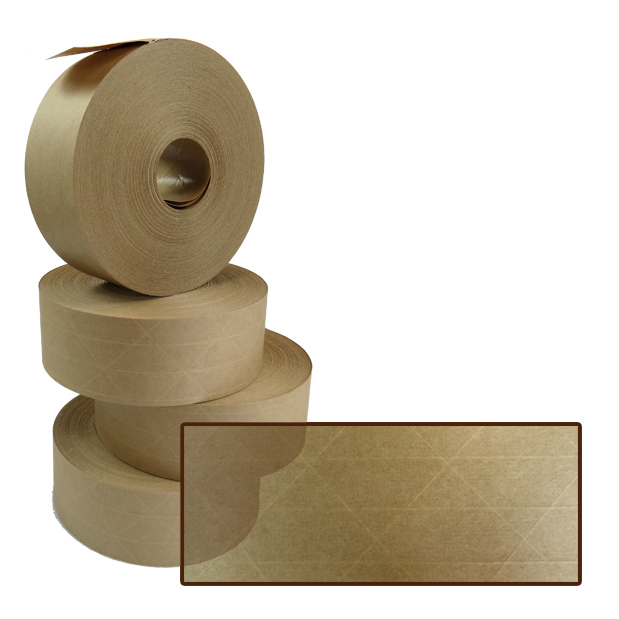 Gummed paper tape also shows the customer that you care for the environment. Cost saving - gummed paper tape is a cost effective of carton sealing, especially when used with an electronic gummed paper tape machine. It only requires one strip to seal, the length of which can be pre-determined by the machine, hence prevents wastage of tape and excess use. Increased productivity and reduced operator fatigue - tests show that using gummed paper tape with an electronic solution leads to increased productivity and reduced operator fatigue, compared to using plastic tape with standard tape guns.